As described in some detail in the related file, the problem concerning the Brazilian pattern is whether Hawkes copied a pattern (Venetian) that was earlier patented by Benjamin Davies and assigned to L. Straus & Sons or whether the Straus company copied Hawkes’s Brazilian pattern, shown on the right, prior to its being patented. In this file we make use of a letter that was discovered when the correspondence between Hawkes’ accountant, Spencer & Mills, and his patent attorney, Knight Brothers, was examined for use in the Briggs file. The Spencer & Mills / Knight Brothers correspondence has been combined with the Hawkes / Knight Brothers correspondence and, together, they have been triple-checked. This correspondence is found in the incoming and outgoing files in the Hawkes archive at the Rakow Research Library, Corning, NY. The files are not complete but enough is available that we can reconstruct what probably happened during the Brazilian pattern’s transformation from a preliminary sketch early in 1887 to a U. S. patent more than two years later. 1. Re Hawkes — Two years old design. We do not think a valid patent can now be obtained. We suggest that he [i. e., Hawkes] change the design somewhat so as to include the essential features thereof which are novel. 2. We think it very important that Mr. Hawkes’s designs be not described in any printed publication before protection is sought. We submitted [the photographs] to the Examiner today to see whether he would accept them in the place of a line drawing. He will not except them. So we shall make a line drawing as soon as the article called for yesterday [the pattern cut on an actual bowl] comes to hand. 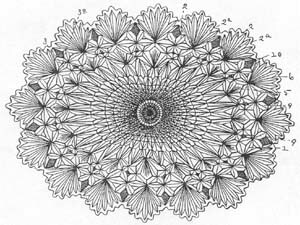 This is why Hawkes sent an actual example of his pattern, as he had to do for the Briggs patents. Knight Brothers received the bowl on 11 April. The patent drawing of it is shown at the beginning of this file. Although this plan view has been drawn as if it were a plate, the sectional drawing, not reproduced here, clearly shows that the item was a shallow bowl. Concerning message no. 2, above: This is quite strange. Knight Brothers seems to be warning Hawkes, but there is no evidence that Hawkes ever publicized his designs prior to applying for a patent. However, Davies/Straus actually did this in connection with the company’s Venetian pattern. The patent attorney could have been aware of this and is warning Hawkes not to do the same. Also, the message could be interpreted as an indication that Knight Brothers felt that somehow Hawkes’s original sketch had been compromised and possibly “leaked” to Straus who copied the pattern — to a considerable degree — in time to use it in the inauguration of the company’s enlarged cutting shop at R. H. Macy & Company’s store in New York City during the summer of 1888. An advertisement for this event proclaimed: “Exclusive Specialty: The Venetian Pattern of Cut Glass.” (Crockery and Glass Journal, 12 Jul 1888). Both messages in the letter of 28 Jan 1889 from Knight Brothers are maddeningly vague. Was there a question of ethics involved? Did the patent attorney, for example, feel constrained to advise Hawkes in this matter prior to his client filing a completed application? Shortly before the time that the patent application was filed, Hawkes had a request: Could he include drawings of his pattern as represented on other objects in addition to the bowl? Knight Brothers thought so, and, therefore, Hawkes had the pattern cut on an ice cream tray and on a claret glass. These were sent from Corning on 29 April. When Knight Brothers received them the firm confirmed that the pattern was essentially the same as that on the bowl and that the two new items could be included in the patent application “by amendment” which meant that, even though the drawings could not be finished until early in May, the original application date, 29 April, could be used. On 10 May 1889 Knight Brothers was able to present Hawkes’ application to the Patent Office’s Examiner and report the result to Spencer & Mills. The report deserves to be reprinted in its entirety because of its relevance to Hawkes’ Brazilian pattern and because of the insight it gives us into the patenting process. 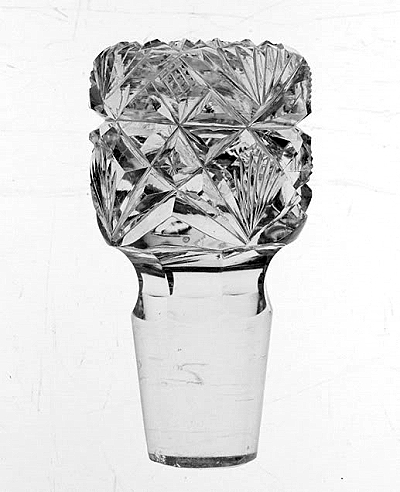 The letter of 10 May was accompanied by the following material: (1) Circular of allowance dated 10 May 1889: “Your application for patent for DESIGN for ornamentation of glassware has been examined and allowed. The Patent will be forwarded in due order of business.”; (2) Invoice dated 10 May 1889 listing the following: Services, additional matter ($3.75, 1 May), line drawings: dish ($7.50, 4 May) and stem-glass ($2.50, 4 May); and (3) printed copy of the Davies/Straus patent ($0.15, 7 May), including illustration containing three forms (fig. 1-3) in combination (same as shown in Revi 1965, p. 113). 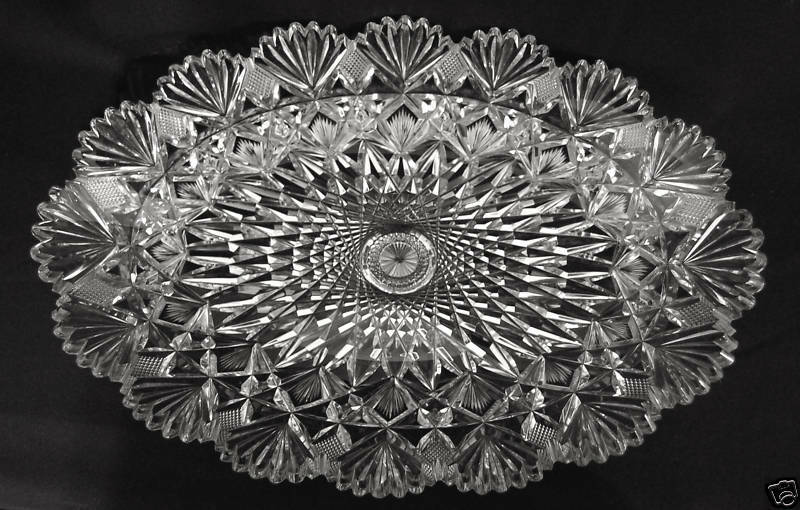 The following two images show a realization of the “dish” that is an exact duplicate of what is found on p. 151 of the HAWKES PHOTOGRAPHIC FOLIO II, where its blank (shape) number is given as 670, and its description: 15″ Tray – Brazilian. In addition the tray’s blank is illustrated in the HAWKES NUMBERS BOOK (of blanks), reproduced by Spillman, 1996, p. 107, where its length is given as 15.5″ (a smaller version, 13″ by 9″, is also listed). In this latter reference the item is called an Oval Tray. Note that today we would probably call this item an ice-cream tray, and as such it was auctioned on eBay during 2009 when it sold for $1,825. L = 16″(40.6 cm), W = 10.6″(26.9 cm), H = 2.25″(5.7 cm), wt = about 9 lbs (4.1 kg) (Images: Internet). Re Hawkes Design – Glass – 309,074 – We have the pleasure of reporting the allowance of this application though the Examiner at first objected to embodying the additional drawings showing dish and stem-glass. He also rejected the application [based] on Design Patent No. 18,791 Davies; but after pointing out the differences between Mr. Hawkes design and the design shown by the reference he allowed the application. We enclose a copy of the Davies patent and also a statement of account covering extra services, and additional drawings, in this application. [P. S.] Official circular of allowance will follow in due course. Later — Circular just to hand and enclosed. 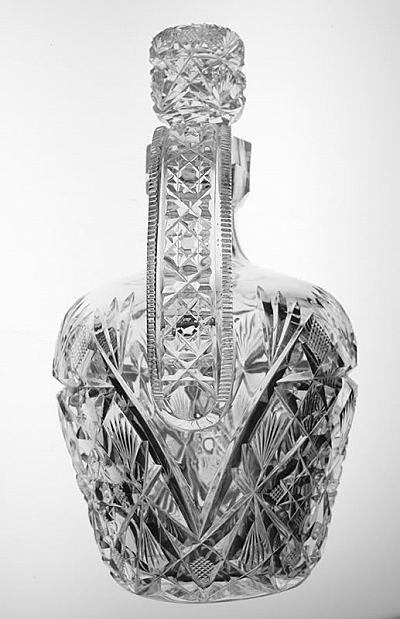 An excellent example of the Brazilian pattern on a vertical object is illustrated by the following images of the pattern on a Hawkes whiskey jug (shape/blank no. 742) that was probably cut during the early 1890s. At this time, shortly after the 1889 Exposition in Paris, Hawkes was producing some of the best items that the company ever produced. Note, for example, the cutting on the jug’s handle. The entry in the HAWKES NUMBERS BOOK for this shape reads as follows: “Qt Whiskey Jug (3/14/91) Burley” (Spillman 1996, p. 109). This entry, with its rare dating and name, raises several questions that should be investigated. H = 9″ (22.9 cm), max. W = 5″ (12.7 cm). Sold for $1,725.00 at an eBay auction in 2010 (Images: Internet). Because she did not use all of the relevant correspondence (although she does cite the letter of 10 May), Spillman (1996) made several confusing and incorrect conclusions in her final paragraph on page 180. For example, there is no record that the Examiner saw Hawkes’s pattern at any time before it was submitted to him on 10 May, and, therefore, he could not have earlier suggested that the pattern was “too close to” the Davies/Straus design. Also, the Davies/Straus pattern was never referred to by Knight Brothers prior to 10 May, and, finally, photographs did not replace draftsman’s drawings at this time. It was the other way around. Note that the letter of 10 May emphasizes the role of the patent attorney. He had prepared himself to support his client’s application which he probably did by (1) pointing out that the three drawings, in place of one, should be accepted because earlier a similar arrangement, submitted by Davies/Straus, had been accepted. And (2), regarding the pattern itself, Knight Brothers probably drew the Examiner’s attention to the horizontal miter cut in the Brazilian pattern (which is lacking in the Davies/Straus design), as well as to the types of motifs and their placement as used by Hawkes compared to their use in Davies/Straus’s design. The patent, no. 19,114, was officially granted on 28 May 1889. 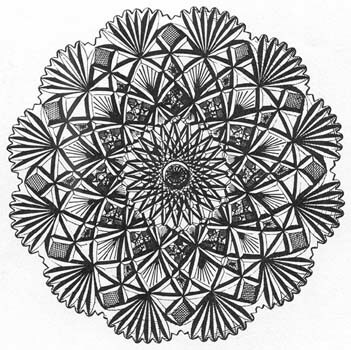 In spite of the additional material in this file, the writer concludes that, objectively, the question as to whether Hawkes based his Brazilian pattern on Davies/Straus’s Venetian pattern, or whether the reverse occurred, remains unresolved. Subjectively, however, he leans toward the originality of Hawkes’s pattern, free of any Davies/Straus influence (except possibly the groupings of three figures on each manufacturer’s patent). Both patterns are fine ones and are worth collecting, not least for the interesting stories that might come to light someday! When searching for correspondence that took place between Knight Brothers and Spencer & Mills two years previous to the former’s letter of 28 Jan 1889 the writer came across a letter from Knight Brothers dated 30 December 1887. It is of particular interest because it was about this time that Hawkes had made up his mind to take part in the 1889 Paris Exposition. We have your favor of 27th inst. and the plaster models and photographs referred to [this was before the decision was made to use only line drawings] and we have carefully examined the latter in connection with the designs shown in Mr. Hawkes’ design patent No. 17,837 [the Grecian pattern]. The claim of the patent should properly be construed to cover both of these new forms but there are striking differences between the several designs which render it important nevertheless for your client to assure his protection by securing separate design patents for the two new forms. We shall therefore prepare application papers and send them to you for execution. The expression “two new forms” refers to what we now regard as the Grecian pattern’s sister designs, Grecian & Hobnail and “Star Rosette”. Applications were filed for both patterns on 9 Jan 1888 and the patents were granted on 24 April. These two patterns, together with the Princess pattern, which was patented on 8 May 1888, are usually considered “exposition patents” because they probably were patented with the Paris Exposition in mind. Each was patented for a term of seven years. Brazilian, the fourth “exposition patent” was patented for 14 years. 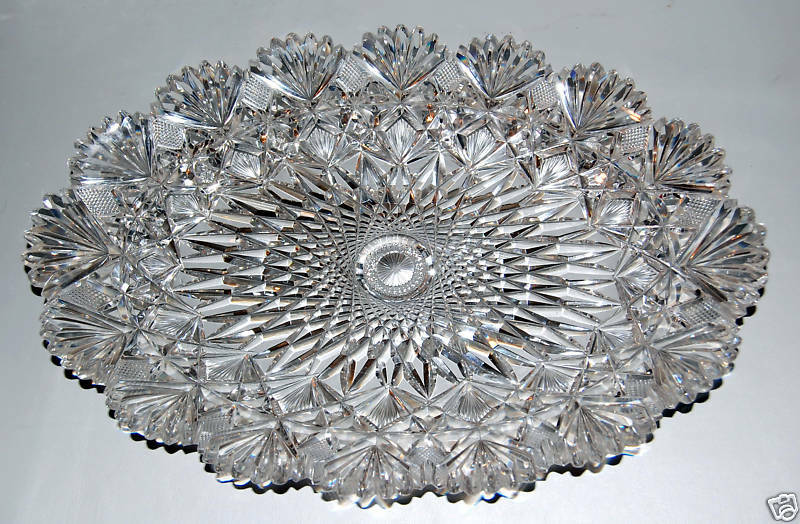 Contrary to what Spillman has written (p. 186), it can be proven, unequivocally, that the Brazilian pattern made the trip to the 1889 Paris Exposition, cut on a two-part punch bowl. 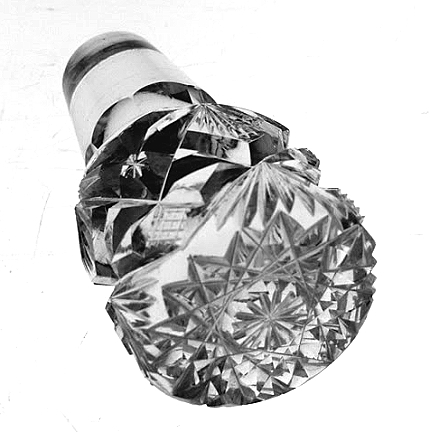 All things considered, the pattern, as a drafted design or as a cutting, certainly experienced a long journey — both in time: from preliminary sketch in 1887 to two-part punch bowl in 1889, and in space: from Corning, NY to Paris, France (with a side trip to Washington, DC for a U. S. patent). NOTE: The auction that contained the Brazilian oval tray also supplied this group image that includes an oblique, three-dimensional view of the tray. Note also that the image includes a tall, elegant pitcher. It too was offered for sale by the tray’s seller, although it was not identified. This item is cut in Hawkes’s Grecian pattern on blank (shape) number 868, according to the HAWKES NUMBERS BOOK (reproduced in Spillman 1996, p. 112). Choices of height are given there as 18″, 16″, and 15″ and the item is described as a “Claret Cup Jug”, possibly a typographical error. There are also coded prices. 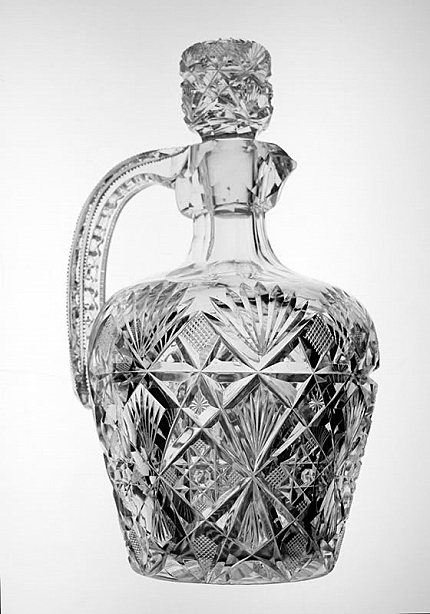 The HAWKES PHOTOGRAPHIC FOLIO II catalog provides a very good photograph of this item on p. 175 where it is described as a “Champagne or Claret Jug”. Its label also indicates that the jug was available in two sizes: 18″H with a capacity of 4 pints and 15″ with a capacity of 2 pints. Unfortunately, the base of the pitcher offered at auction was damaged at some time in the past, possibly when the jug was made. To repair it a sterling silver mount by Gorham was attached to the jug’s base making it leak-proof. H = 18″(45.7 cm), base D = 5.1″(13.0 cm), wt = about 8 lbs (3.6 kg). The damaged jug sold for $749.95 in 2009 (Image: Internet).